Sweden held a general election on 9 September, alongside regional and municipal elections. The early results of the voting showed the country’s two main blocs each securing around 40% of the national vote, and the Sweden Democrats winning around 18%. Stuart Brown presents an overview of analysis and reactions from across Europe. Responding to the result, Spanish newspaper El País labelled the elections “unprecedented” and described the contest as a “vote between integration and xenophobia”. For eldiario.es, the key stories, much as they were elsewhere across the media, were that the close results secured by each of the main blocs will make forming a new government complicated, and that the nationalist Sweden Democrats (SD) had made clear gains, increasing their vote share from 12.9% at the previous election to 17.6%. As Nicholas Aylott and Niklas Bolin explained in their preview of the election for EUROPP, there have traditionally been two main blocs in Swedish politics (a left bloc and a right bloc). The current blocs are the so called ‘Red-Green’ bloc, which was set up by the Social Democrats before the 2010 general election, and the Alliance, which was established by four centre-right parties in 2004. However, although these two blocs continue to be discussed in relation to the 2018 election, the arrangements are now far looser than they once were, in part because the rise of the Sweden Democrats has had an important impact on the Swedish party system. In a previous EUROPP article, Anders Hellström has assessed the importance of the Sweden Democrats for the 2018 election, and how their policies on immigration and crime have influenced the other major Swedish parties. Both of the main blocs had indicated before the election that they would refuse to govern with the Sweden Democrats. The Sweden Democrats: Winners or losers? We really need a big change in Sweden, another way of thinking. We are lagging behind. Our health care system is deteriorating, academic results are breaking down, integration is not working… And in the meantime, all the parties refuse to talk to the Sweden Democrats. It’s insane. For others, however, the Sweden Democrats are not the answer. Another voter indicated that she was scared of what support for the Sweden Democrats might mean for the country, stating that “the future of our beautiful open society is threatened”. In the immediate aftermath of the result, many reactions therefore focused on whether the result was a breakthrough for the party, or whether it should rank as a disappointment given some polls during the campaign had put the Sweden Democrats as high as 25% of the vote, in first place ahead of the Social Democrats. 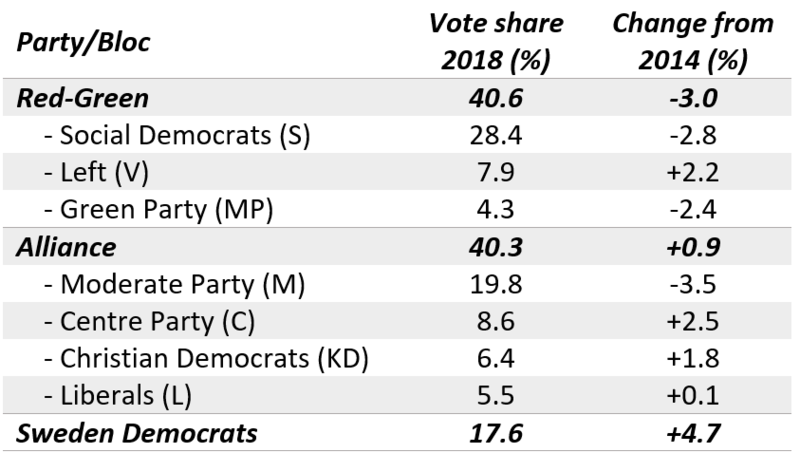 The 2014 gains of #SwedenDemocrats were 1.5 times as big as in 2018 (7.2% vs 4.7%). In case you're still thinking of pushing your "refugee crisis" take. Åkesson: "Friends of Sweden, we are not satisfied. We see that we are this election's winners, and as we move towards a new government we intend to ensure we have real influence over Swedish politics." The crowd likes this a lot. Given the tight nature of the result, it remains unclear what the composition of the next Swedish government might be. German newspaper Die Welt gives a rundown of the possible outcomes. They write that the nature of the result means the parties will have to seek new allies. Among the available options are the Alliance breaking with its previous stance and negotiating an arrangement with the Sweden Democrats, a complete breakdown of the two existing blocs with some form of coalition negotiated between them, or one (or more) parties within the existing blocs opting to change sides – they note that there has been speculation in the past that the Centre Party could be open to switching to the left. With few other realistic paths open for a new government to be formed, this would leave the country heading for political deadlock. Yet as the English-language Swedish news site thelocal.se concluded in its liveblog of the results, while the election was inconclusive, it is worth remembering “that if there is anything the Swedes are good at, it’s finding compromises where you think there are none”. Stuart Brown is the Managing Editor of EUROPP and a Research Associate at the LSE’s European Institute.